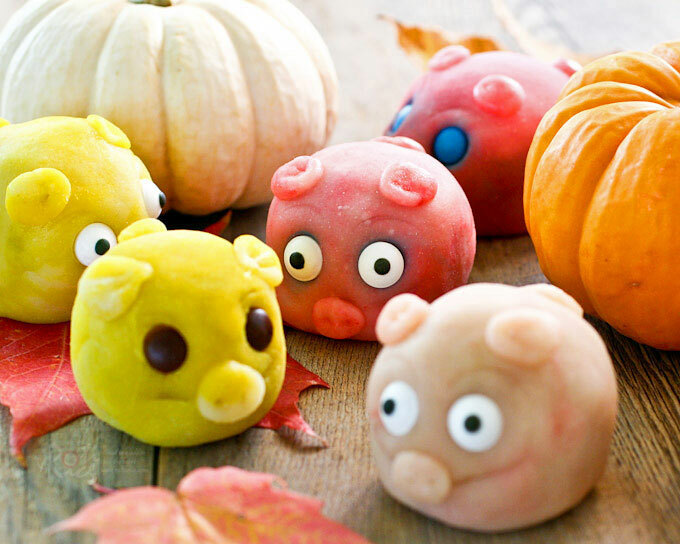 Delightful gluten free Snowskin Mooncake Piggies with lotus seed and red bean paste filling for the Mid-Autumn or Mooncake Festival. This little piggy went to market, this little piggy stayed at home… In this case several Snowskin Mooncake Piggies stayed home. I had a lot of fun making the “chinny chin chins” of these little confections just in time for the Chinese Mooncake Festival a.k.a. Mid-Autumn Festival which falls on September 30th this year. Some of the ingredients were fresh off the plane from Singapore. Not a moment to lose, into the moon cakes they went! There was some huffing and puffing to get the whole process going. Once I got the rhythm though, piglets were taking shape fast and furious. So what do pigs have to do with the Mid-Autumn Festival? Not much except that some of us may remember the traditional piggy shaped budget mooncakes (with no filling) in Chinatowns across Malaysia and Singapore. 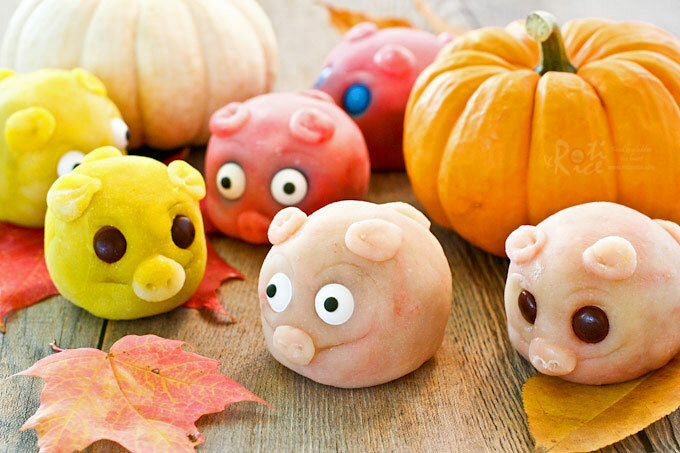 Call it “oinky nostalgia” but these Snowskin Mooncake Piggies are quite different and so adorable! Ann used chocolate pearls for her piggy’s eyes but I could not find any here. 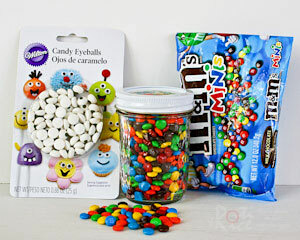 I did however find some candy eyeballs and mini M&M’s which were the perfect size. Do leave the eyes off until ready to be serve as the moisture from the snowskin and filling can cause the candy eyes to get saturated. 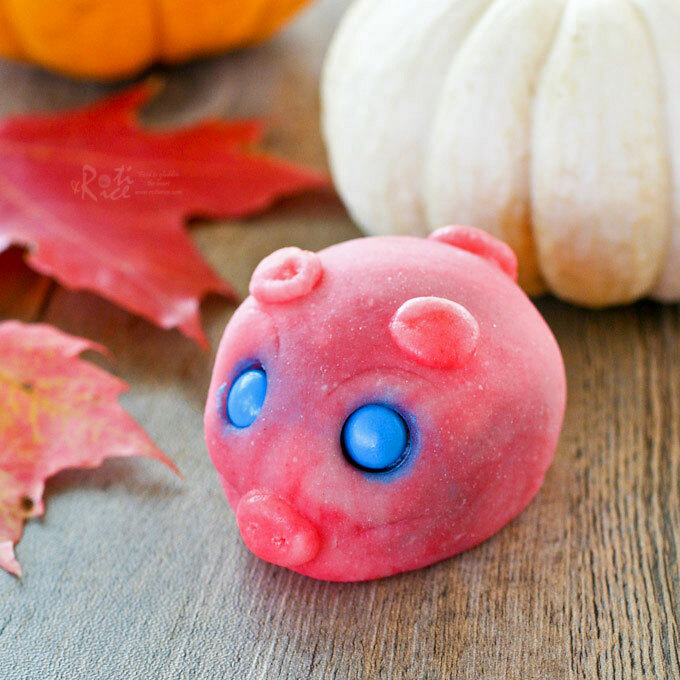 Since I used two kinds of filling – lotus paste and red bean paste, I thought it might be a good idea to identify them by using different candy for the piggies’ eyes. 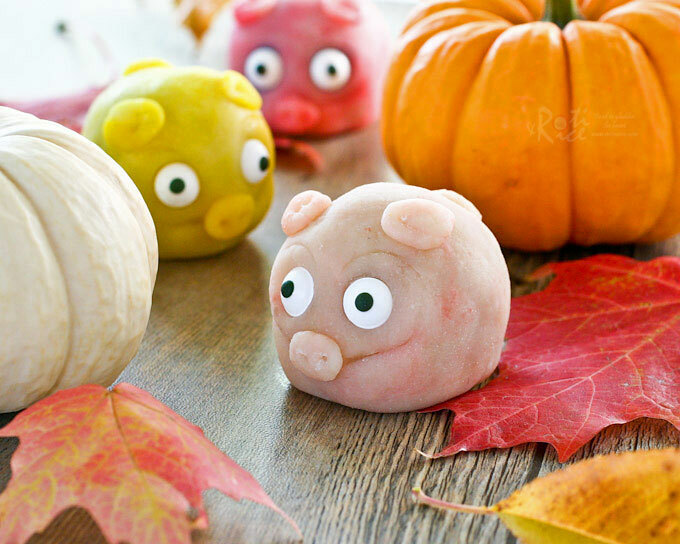 The piggies with the googly eyes have lotus paste filling in them. 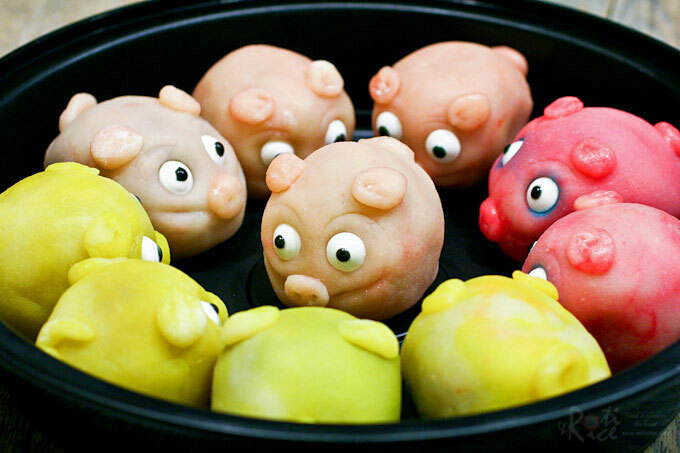 These piggies with mini M&M’s for eyes have red bean paste filling. They look so wide-eyed and adorable! I used store bought ready made lotus seed paste, red bean paste, and snowskin premix which may be easily purchased from the bakery supply shops in Malaysia and Singapore. 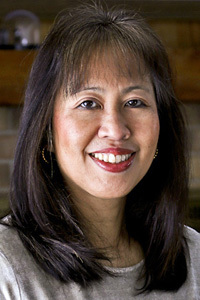 Red bean paste in cans and lotus seed paste in bags may be purchased at the Asian grocery stores here in Minnesota. If you wish to make your own filling, please check out my Red Bean Paste recipe. 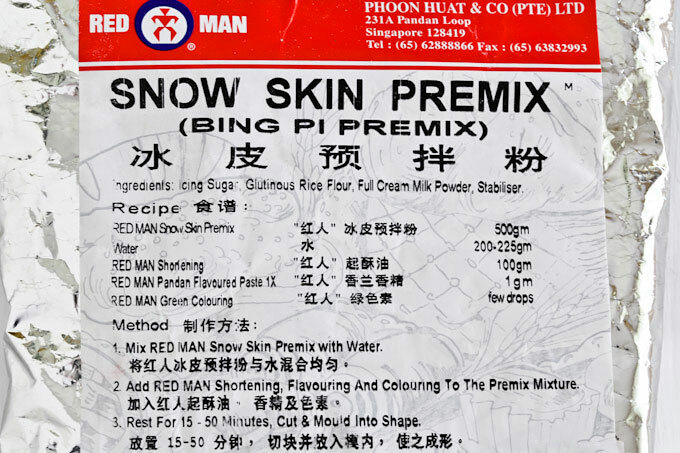 The snowskin premix is a combination of glutinous rice flour, milk powder, sugar, and stabilizer. There are quite a few blogs out there creating their own mix but I have not tried any one of them. If you can’t find the snowskin premix, I suggest dry frying 1½ cups (180g) glutinous rice flour in a pan on the stove. Instead of the 5 minutes as stipulated in the recipe below for ¼ cup (30g) glutinous rice flour, you many need to fry for 15 to 20 minutes instead. Then measure out 1¼ cups (150g) of fried glutinous rice flour and add 1 tablespoon dry milk powder. This should take care of the first two ingredients in the recipe below. The recipe below was adapted from Anncoo Journal to suit local measuring conditions and availability of ingredients. I used vegetable oil instead of shortening and inadvertently omitted the powdered sugar. However, I am pleased to say that it did not affect the outcome at all. In fact, I was very pleased with the texture and Ro-Ri San and Ro-Jiro thought it was superb! The dough was soft and smooth after resting two hours in the fridge. It was just as good the next morning. Snowskin mooncakes should be consumed within 3 days. Please check out Anncoo Journal‘s fabulous step-by-step slideshow and her super cute piggies. You don’t want to miss it! 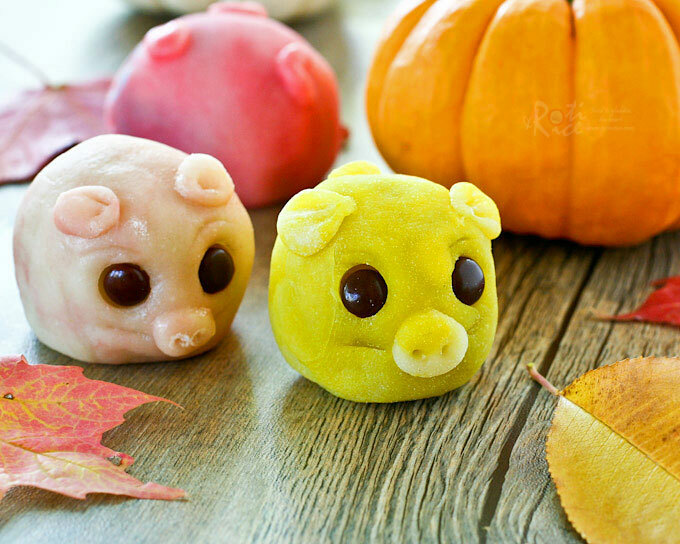 Delightful gluten free Snowskin Mooncake Piggies with lotus and red bean paste filling for the Mid-Autumn or Mooncake Festival. You will also need a pair of plastic gloves, a skewer, and a small measuring spoon. Dry fry kuachi (melon seeds) over medium heat for about 5 minutes. Remove and allow it to cool. Mix 2 tablespoons kuachi each to lotus paste and red bean paste. Form each filling into 5 balls measuring slightly under 2 oz (50g) each. Set aside. Dry fry glutinous rice flour over medium heat for about 5 minutes. Remove and allow it to cool. Combine snowskin premix, powdered sugar, and ¼ cup cooked glutinous rice flour in a medium sized bowl. Set aside. Bring 2/3 cup (150ml) water to a boil in a small saucepan. Turn off heat. Add vegetable oil and vanilla extract. Remove and pour hot liquid over flour mixture. Stir with a spatula to form a soft, sticky, and oily dough. Allow dough to cool. When it is cool enough to handle knead dough until smooth, adding more cooked glutinous rice flour when needed. Put on plastic gloves and divide dough into 10 balls of approximately 1 oz (30g) each. Take a ball of dough in the palm of your hand. Add 1 to 2 drops of food coloring to dough and knead till food coloring is fully incorporated. Pinch out 4 tiny balls of dough for the snout, ears, and tail. Set aside. Place the ball of dough on a lightly floured surface. Roll out dough with a small rolling into a disc of approximately 3½ inches (9cm) in diameter. Place a ball of filling onto dough and wrap dough around the filling. Roll it between your palms to form a smooth ball. Press a line with the skewer on each side of the piggy’s face. Press out the piggy’s eyelids with the small measuring spoon. Gently press 2 candy eyeballs below each eyelid. Press a tiny ball in the front between the two lines to for the snout. Press two tiny holes into the snout with the skewer. Next, flatten two tiny balls of dough to form the ears. Place each one above the eyelids to form the ears. Use the skewer to press 2 tiny lines into each ear. Finally, roll the last tiny ball of dough into a cylinder and attach it to the back of the piggy for the tail. Use a skewer to press a tiny indent just below the tail. Repeat with the rest of the dough and filling. Cover and chill in the refrigerator for at least 2 hours before serving. WOW! You are not only a great cook but a great decorator of the food as well. I can’t believe you made these. they are so so cute! Hi Biren! These piggies are so adorable!! I have actually never seen mooncakes made into piggies before. This is my first time, and they just look so cute! Now, I want to play with making these at home too. I hope my Asian grocery store will carry lotus seed paste and red bean paste! Hi Biren, the pigglets are so , so cute !! Thanks for sharing and the recipe is for share to keep in my hard disk. I can’t try it out until in Nov as I’m busy treveling soon. Thanks Rebecca! Hopefully you get to make these soon but you may want to buy the ingredients now as they are seasonal. WOW Biren! 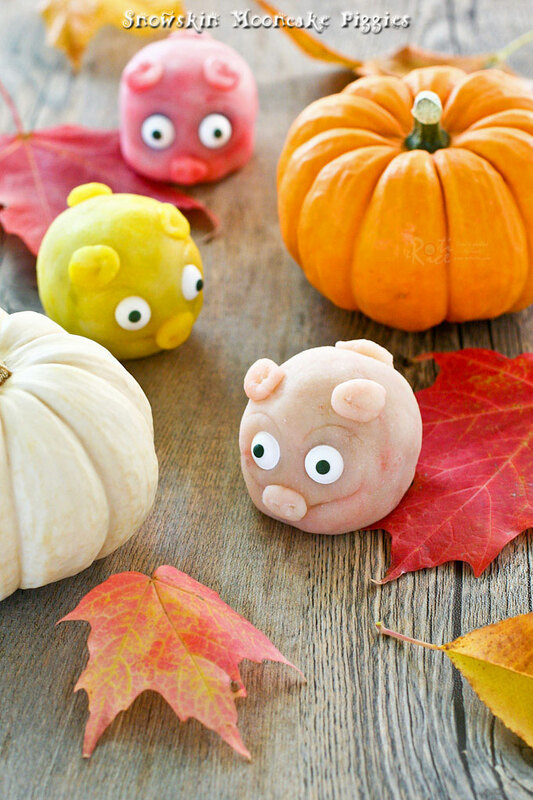 Your piggies look super cute especially the one with blue eyes 🙂 I also love the way you displayed them next to the pumpkins, so pretty! Happy Mooncake Festival to you and your family! I love your cute piggies:) Yes, I remember those little brown piggies in a red plastic baskets too! Not nice at all without any filling! Now we are so spoilt for choice! These totally rock! So attractive and creative. I’m in awe of your decorating talent. Pictures are wonderful too, and the post is extremely well written (and funny!). Truly good stuff – thanks. Biren, what gorgeous piggies, too nice to be eaten! I salute your talent and artistry. My children and I all agreed that the snout is the most adorable part of the piggy. We said that the next time you visit us, we will ask you to make them…..